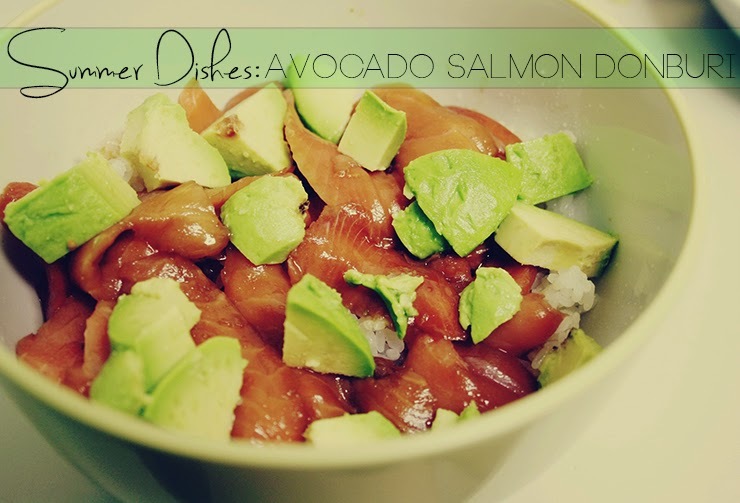 Summer Dishes: Avocado Salmon Donburi. Today I wanna share with you a super simple and fast summer dish! It is lately extremely hot in Japan and I kind of don't have any motivation to eat a hot meal (or anything, to be honest) so I was craving something cold and fresh. As you already know I am a huge fan of avocado and I also really like salmon - since salmon is really expensive in Japan I don't eat it as often as I would like to ._. But I try to eat fish at least once a week from now on! As for the donburi, this term just means that the dish is placed over a bowl of steamed rice. I love this dish because it is very satisfying although you don't need much ingredients - if you have a rice cooker you even don't have to use a stove. No dishes, yay! 1. Cut the salmon into thin slices. You can use raw or smoked salmon whichever you prefer; I usually like smoked salmon a little bit more. Place the salmon into a bowl and marinade it with 3 to 4 tablespoons of soysauce, 1 1/2 tablespoons of olive oil and a bit of pepper. Place it into the fridge for about 30 minutes. 2. Meanwhile, cook the rice and cut the avocado into cubes. 3. When the 30 minutes are up, put the hot rice in a bowl and place the salmon-avocado mixture on top. Sprinkle lemon on top as much as you prefer, I usually use a little less than half. This is a very nice dish on the evening when it just doesn't want to cool down so you have to cool down yourself somehow. I love the mixture of hot rice & cold ingredients on top but I know there are some people who cannot stand this *coughboyfriendcough* I adjusted this recipe from the book パパごはんの感動レシピ which is a book for fathers who want to get into cooking! Japan really has a book for everything and everyone, its amazing. I bought this book because it had simple recipes one could really cook on a daily basis and extremely easy step-to-step pictures. What goes really well with this is tamagoyaki, a sweet fried egg (mix 2 eggs, 1tbs soy sauce, 1tbs mirin and about 1tbs sugar) that you eat with soy sauce. I accidentally dropped an egg and didn't want to throw it away so I made tamagoyaki with this and liked the combination very much. Let me know if you try this recipe! Do you have any favorite dishes in summer..?